To the dedicated millions who can’t get enough of Heather’s unique style and hilarious stories on her hugely popular blog, there’s little she doesn’t share about her daily life as a recovering Mormon, wife of a charming geek, lover of awful television, and stay-at-home mom to five-year-old Leta, newborn Marlo, and two willful dogs..
Now, Heather shares, with biting wit and unrelenting honesty, all the other minor details of pregnancy and motherhood that no one cares to mention—like anxiety, constipation, and postpartum depression. There are lonely days, sleepless nights, and endless screaming. There’s the boredom that comes with caring for someone whose primary means of communication is through her bowels. And there’s the heart-swelling joy and utterly irresistible and totally redeemable fresh baby smell that makes it all worthwhile.. 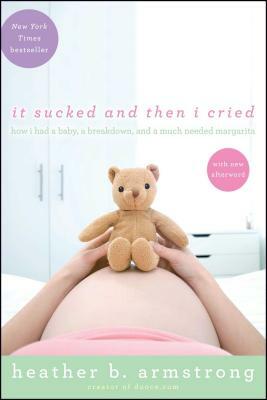 It Sucked and Then I Cried is a brave cautionary tale about crossing over that invisible line to the other side (the parenting side), where everything changes, and it can get pretty unpleasant. But more importantly, it’s a celebration of a love so big it threatens to make your heart explode. .